Peel and cook the potatoes in boiling salted water, then mash the potatoes with egg, parsley, grated parmesan, butter, salt and pepper, and mix well to achieve a smooth mash. Fry the bacon in a pan until it is crispy, and then cut the camembert into small chunks. Place the mashed potato in the piping bag and pipe small nests onto baking paper on a baking tray. Fill the nests with the bacon and the camembert chunks. 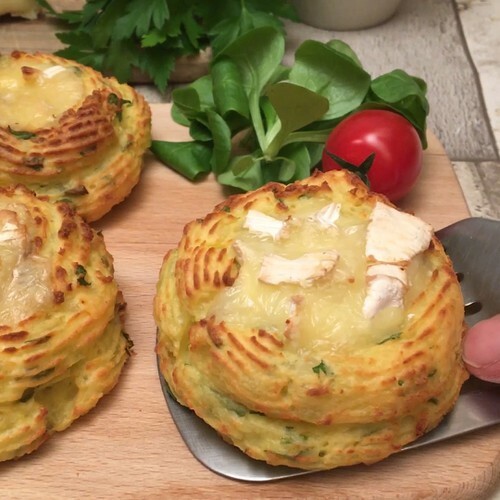 Bake the nests for about 15 minutes at 180°C to get a crisp coating and melted cheesy middle. Enjoy hot and fresh.